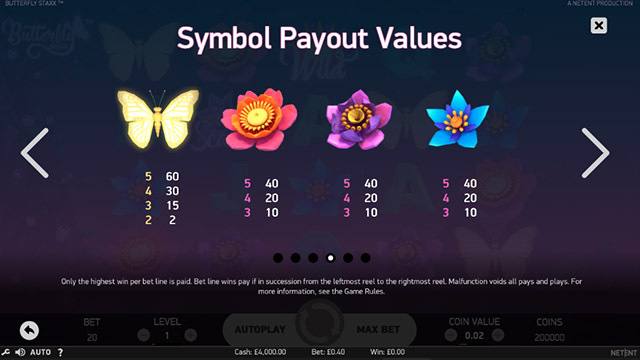 Butterfly Staxx Slot by NetEnt | Play it for free now! 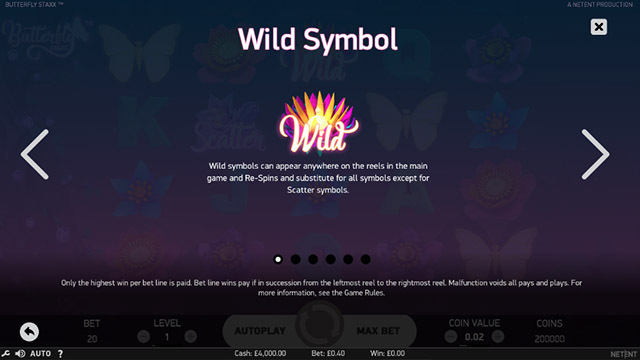 Wild symbols can appear anywhere in the reels during the main game play or in the Re-spins rounds. 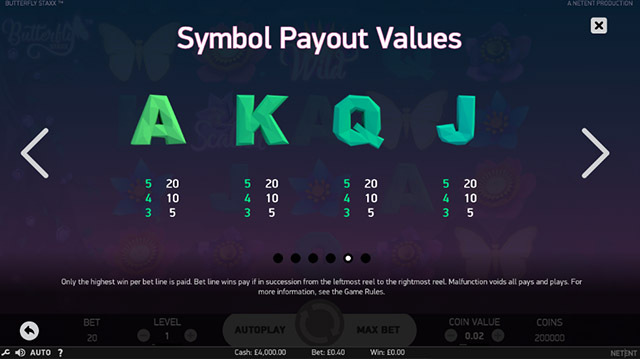 These symbols substitute any other symbols except for scatters, and also pay the highest winning combinations on a bet line. The Re-Spins are activated when an entire stacked reel is covered with Butterfly symbols. These Butterfly symbols will flutter to the leftmost position on the same row (which is not already occupied by a Butterfly symbol) and rest on the reels until the Re-Spins are over. 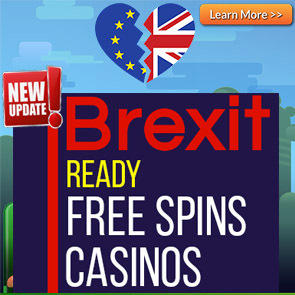 When there are no more Butterfly symbols to land on the reels during the Re-Spins round, then the Re-Spins end. 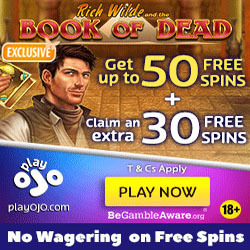 All bet line wins are paid out. 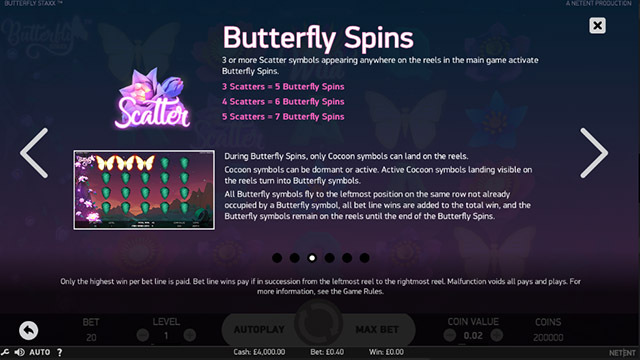 Butterfly Spins are activated when 3 or more scatter symbols appear on any of the reels in the main game. During the Butterfly Spins, only cocoon symbols can land on the reels. 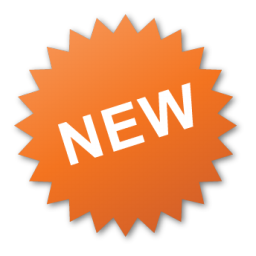 These cocoon symbols can either be dormant or active. If they are active, then they turn into Butterfly symbols. Unfortunately, additional Butterfly Spins cannot be won during the Butterfly Spins rounds. 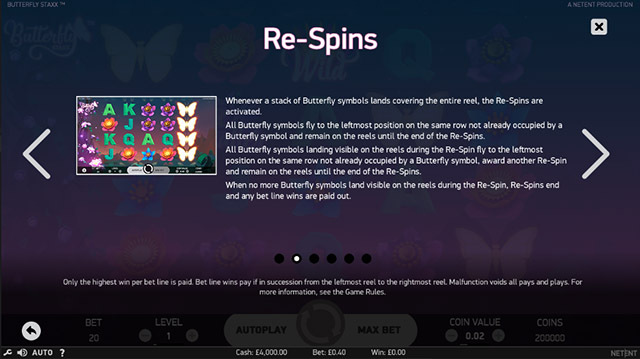 At the end of the Butterfly Spins, any wins are added to the previous round that activated these spins. Butterfly Spins and Re-Spins cannot be active at the same time during game play.